Do your eyes itch, burn, or become excessively watery on occasion? Then you may benefit from omega 3 supplementation. In a recent study by Wojtowicz JC and associates, subjects with dry eye were given an omega 3 supplement or placebo for 90 days. At the end of the study 70% of the subjects receiving the omega 3 supplement no longer had dry eye symptoms vs only 7% of the placebo group. 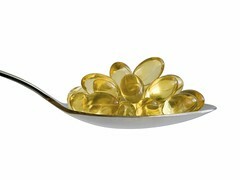 Schirmer testing and fluorophotometry suggested that the improvement in symptoms were due to increased tear secretion in the subjects that took the omega 3 supplement. This entry was posted on Monday, April 11th, 2011 at 2:00 am and is filed under Dry Eye. You can follow any responses to this entry through the RSS 2.0 feed. Responses are currently closed, but you can trackback from your own site.